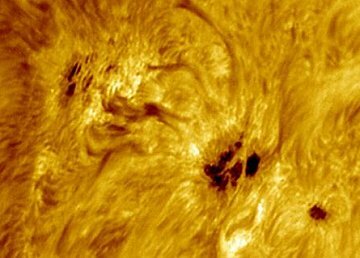 Sunspot 892 poses a slim threat for M-class solar flares. Photo credit: Tom King of Watauga, Texas..
RED JR IN PERIL? Jupiter's young red spot, Red Jr., is about to have an uncomfortably-close encounter with the oldest and biggest storm in the solar system--the Great Red Spot itself. Red Jr. won't be destroyed, but it could change color as a result of the encounter. Get the full story from Science@NASA. Meanwhile, far from this impressive spot, a flame-shaped prominence has leaped into view and is dancing along the limb of the sun: image. So this is solar minimum? Apparently, any time is a good time to watch the sun. 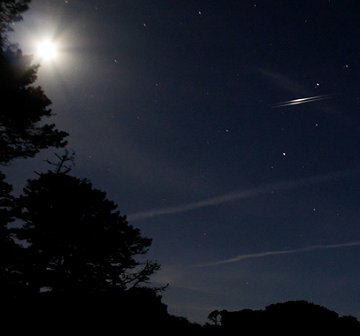 DOUBLE FLARE: Sky watchers who've witnessed an Iridium flare rarely forget the experience. Sunlight hits a flat surface on one of the Iridium satellites and--wow!--it looks like a supernova. The two satellites were Iridium 7 and Iridium 51, passing overhead only 2 minutes and 30 seconds apart. With a bit of judo photography, Laveder managed to capture both flares in the same image. A larger version of the image also shows Saturn, Mars and the beautifully moonlit Odet River: labeled, unlabeled. Would you like to see an Iridium flare? Visit Heaven's Above for local predictions. You are visitor number 33985921 since January 2000.